Tonight we witnessed Phillies baseball in it’s purest form. The Fightins won 3-1 as Roy Halladay pitched a gem, Ryan Howard and Domonic Brown pieced together a run, Chase Utley delivered a clutch bomb and Jonathan Paplebon scraped together a save. The start of tonight’s game was delayed approximately 30 minutes for Mike Lieberthal’s induction ceremony in to the Phillies Wall of Fame. 1993 shortstop Kevin Stocker unveiled the plaque in center field, while Pat the Bat, Lefty, the Bull, Schmitty, the Secretary of Defense, Krukker, Larry Bowa and Dallas Green celebrated on the field. Lieby gave a light-hearted speech and later Bowa and Kruk participated in the telecast. All-in-all it was a fun night for the alumni. But if fans are having a hard time remembering some of Mike Lieberthal’s career highlights, recall he was a Gold Glove Award winner, two-time All-Star and 2002 NL Comeback Player of the Year while playing 12 years in Philadelphia. Roy Halladay threw 99 pitches over eight innings and 72 of them were strikes. He was in command all night, fanning eight batters while allowing just two hits and zero walks. The one run allowed came in the second inning in the form of a solo home run by Carlos Beltran. That was the only blemish on the evening and Doc improved his record on the season to 6-6 with a 3.80 ERA. To his credit, Kyle Lohse pitched well himself, allowing one run over 7 innings with seven strikeouts. The game lasted just under two-and-a-half hours. With the starters cruising past the seventh inning stretch and the game tied at one, it was unclear how this game was going to end. Rookie manager Mike Matheny pinch hit for Lohse with two outs and nobody on in the eighth. Halladay promptly struck out Matt Carpenter and Barret Browning came in to pitch the bottom half of the inning for the Cardinals. Jimmy Rollins started off the frame with a single. After a balk and sac fly bunt by Juan Pierre, JRoll was on third and Utley was at the plate looking to hit something deep enough to score a run. Boy did he! Chase blasted a clutch 2-run home run into the bullpen in right-center. This was Papelbon’s cue to get loose and preserve the 3-1 lead. 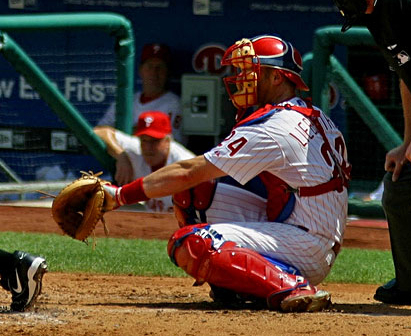 Jonathan Papelbon‘s 25th save of the season wasn’t without some drama. He allowed a double and single and faced runners on the corner with two outs. Before delivering a pitch to David Freese, Paplebon faked a pick off attempt to third base and instead turned to witness Carlos Beltran breaking for second. A quick toss to Jimmy Rollins and the game was over. Phils are out of the basement, at least for now.